White card stock is just about indispensable around our house. There are so many good uses for it! Lately, we've used it to make alphabet wall pockets for practicing letters and colors. I take a full piece of card stock and tape a half-sheet on the sides and bottom. Half sheets, when they are turned vertically are just the right size for stuffing into the pocket. M is at an age when she loves matching, but sometimes she does need a little help actually stuffing the pockets. I tried to make the pockets multipurpose by including upper case, lower case, pictures, and colors on each one. That way, I can use four different sets of stuffing cards on the same set of pockets. This system has successfully taught M to recognize and say the names of new letters - and it's fun! It makes me happy that you don't have to spend oodles of money on leapfrog and other expensive toy brands to have effective learning tools! 2. Bring hot chocolate packets and marshmallows, and make hot chocolate with hot water from the in-room coffee makers. Make a tradition of sipping hot chocolate while you all watch the weather predictions for the next day on TV. 4. Surprise your kids by doing handstands in the pool with them. 5. Bring your atlas in from the car, and see if your kids can find your location on the map. Then see if they can find your destination and ask them to try to figure out the best route for getting there. Build anticipation for the next day by talking about the kinds of things you might see along the way and interesting tidbits about the cities that you will travel through. 6. Come up with silly contests using the ice from the ice machine. (Going to get the ice is part of the fun for kids) Here are a couple ideas: Who can hold an ice cube in their hand the longest without opening their hand at all? Who can make the ice cube disappear most quickly in their mouth (without chewing it)? Play "real freeze tag." Everyone who is not it, must balance an ice cube on top of their head while they run. If the ice cube falls off, that person is "frozen" and must be touched by a teammate before they can move again. 7. Start a collection of "freebies" from motels, and keep them in a special box. 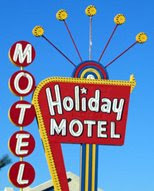 Kids will have fun running around the motel room looking for items to add to the stash. 8. Keep a family vacation journal, and brainstorm together in the motel room about what sorts of things should be included from that day's adventures. Designate a different person each night to be the scribe. During the brainstorming session, each child could also be drawing pictures from what they remember of the day. 9. Find the Gideon Bible that has been left in the room. Let each person find a verse that is special to them, bookmark the place and write a short note about the verse to be left in the Bible for the next motel guest to find and read. 10. Get on the internet as a family and find out something interesting about the town where you happen to be staying. Does it have any unique history or off-beat claims to fame? 11. Start a tradition of searching for the best burger (or hot dog or bowl of spaghetti or whatever!) that you can find as a family. In every town you pass through see if you can eat at someplace that serves that item. Each of you taste it, and give the item a rating 1-10. Have fun discussing your disagreements. Won't it be fun to say someday, "The best burger I ever had was in the little town of Almena, Kansas"? 12. Create a car cleaning ritual. As soon as you check into a hotel, your family knows that it's time to clean out the car. Make it fun by running a stopwatch. Tell them that for every minute under a half an hour it takes to get the whole car clean, they may stay up that many minutes past their bedtime. Hopefully, the incentive will not only make your kids work quickly to clean up, but it will motivate them to keep the car clean during the day! 13. Write a thank-you note for the cleaning staff who will tidy the room after you are gone. Let every family member sign the letter, and then before you leave in the morning, have the kids hide pieces of wrapped candy for the cleaning staff to find and keep as thank-you treats! Because the students at my husband's school so thoughtfully donated a Borders gift card to our family after the apartment fire, I have had a good excuse to go lurking around the bargain shelves there lately. Today I happened upon two great finds for our family! The first one I just love already and can't wait to delve into more deeply. It's The Original Girl's Handy Book was first published in 1887 and written by two of the founders of the Girl Scouts. It's a regular compendium for rediscovering lost arts. Listen to some of these fun topics: Easter egg dolls, how to host a corn roast, quiet games for hot weather, how to make a hammock, nutting parties, the Maypole dance, bran pie as a means of Christmas gift distribution, a heap of rubbish and what to do with it. Not only do there appear to be lots of fun ideas for actual use, but it is so delightful to read about them in the quaint style of the 19th century, complete with Victorian illustrations. I love the resourceful femininity that it celebrates! (Apparently, there's a boy's equivalent out there that was published much earlier that would be fun to acquire at some point too) The second find I recommend for more pragmatic reasons. I don't know how many of you are like me in that you have found yourself with a baby you wanted to sing to, but discovered that your reserve of lullabies and fun rhymes was pathetically lacking. When M was born I found myself only half- remembering songs that I heard growing up and just generally wishing I knew more children's music. Wee Sing Classic Rhymes and Lullabies is a good way to remedy this deficiency and a great tool for preparing for a baby on the way. It comes with two song books "Wee Sing for Baby" and "Wee Sing Mother Goose" as well as two CDS with recordings of the songs. In listening to the CDs I found that the Wee Sing company has "jazzed up" their music a little from what I remember as a child, but generally they do a good job keeping the songs simple, melodious, and sufficiently slow to be appropriate for children. (I don't like a lot of children's music that's made now because it tends to be so percussion-heavy and seems more geared toward turning kids into cool teenagers than letting them enjoy the simple sweetness of childhood). Even though M seemed to enjoy the CD pretty well when I played it in the car this morning (especially in comparison to the talk radio that I normally listen to when we drive) I would have to say that I think that the CDs are more useful for parents than for children. After all, what's so wonderful about baby songs is how interactive they can be. There's so much touching, tickling, and giggling with the baby that a CD just can't do. I'm really looking forward to doing nature walks with my kids someday. I've been collecting nature identification books (birds, rocks, trees, flowers, etc) for quite some time in anticipation of when we will be able to use them as a family. At 18 months, however, M. is not very up for that kind of thing. The other day, though, we did go on a simplified nature walk. I labeled two bags as "sticks" and "rocks" (the two things she interacts with the most when we go on our walks around the ranch. I was pleased that she seemed to understand the concept and after a little explaining and demonstrating, was taking initiative to put the correct objects into each bag. At first she seemed to be having fun with it, but with many sorting activities we've done together so far, it got old after about 7 minutes. Oh well, it was fun while it lasted, and we enjoyed the rest of our walk anyway. I just love the look of old fashioned silhouettes- and of course, it's even better when the pictures are of people one knows and loves. Our family was fortunate to have an artist friend who made silhouettes of all of us when we were young. They have hung on my parents' living room wall ever since. I got inspired to try to make a gift out of the shadow pictures this Christmas by Monica's post over at the homespun heart. She even explains how to make your own silhouettes from photographs if you don't happen to have any family silhouettes hanging around like we did. First, I needed to scan copies of the silhouettes, resize them, and print them out. Then I used a pair of scissors and cut out the silhouette (some people use exacto knives, but I don't like them so I just cut with scissors and used a piece of scotch tape to mend the initial cut). I taped the empty silhouettes to an apron that I wanted to give as a gift and used black fabric paint and a thick brush to create the pictures. They did bleed a tiny bit, but overall, it still turned out nicely. Next time, I would make sure to always brush toward the center of each silhouette and let my paint get a little thicker. I remember from my childhood growing up in the North that this is just about the time of year when one can start to become really weary of winter. The skies are gray; Christmas is over, and it is still so very cold. Here's a fun tradition from my childhood that helped to add a little cheer to the winter doldrums. The next time there is a big fluffy snow you can declare to your children, "Well, this is just perfect snow ice cream weather!" Send them outdoors with a spoon and a big bowl and ask them to gather the softest, whitest, cleanest snow they can find. Meanwhile you will be gathering the rest of the ingredients. To the snow add enough milk just to moisten it- not to make it soupy. Then add sugar and vanilla to taste. Let one of the children do the mixing so they feel it is really "theirs." Scoop it into bowls and enjoy your snow ice cream! By the way, you may remember that Mary and Laura made snow ice cream in The Banks of Plum Creek. It might be fun to read that book and THEN wait for the next big snow. Also, I remember occasionally growing up and occasionally trying a new flavor- like peppermint, by adding a couple drops of peppermint extract. Well, we finally have the internet up and running at our new place, and it's so nice to be back to blogging! There are so many things I have been waiting to write about, but I think I'll start by telling you about the wonderful little home that the Lord has provided for us. I call it "Little House on the Ranch" (in Ingallsian fashion, of course). For approximately the same low rent as our old two bedroom apartment in the city we now live in a 3 bedroom manufactured home on a 400+ acre cattle ranch. M is, of course, tickled with the animals, and she and I get to enjoy nice walks on the property. 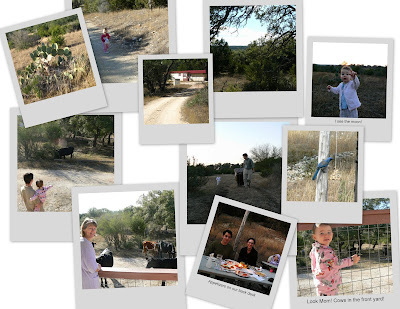 The ranch is situated in the hill country and has some lovely views. Just another example of the many good things that the Lord has brought out of the apartment fire! My incredibly nice sister drove all the way from Georgia to Texas the morning after our fire to help out. She was invaluable in the not-so-fun task of sorting through the burned apartment to salvage what could be saved. After we had been pitching things for a while, we found a way to have a little fun. The kitchen, like most of the apartment was very smoke and water damaged and was going to need to be gutted. In the cupboards we found bags of flour, baking soda, etc that were of course, no longer good for human consumption. They were good however, for letting off a little steam. Here is my sister having a ball throwing cornstarch into the air and making a grand mess even messier. At around 10:3oam on Friday, December 12th my husband got a call at his work saying that there was a fire at our apartment and did he know where his wife and child were. He thought for a moment and then was relieved when he remembered that I had told him that M. and I would be gone that morning. The apartment manager told him that the damage to our apartment was complete. My husband called me right away on my cell phone to tell me the news- what a shock! Life certainly is unexpected! For a long while things felt very surreal and verses like James 4:14 kept ringing in my head. "You do not know what tomorrow will bring." The school where my husband teaches immediately sprung into action to help us- arranging a place for us to stay and collecting money and donation items to replace our lost possessions. Friends and family all over the country began pouring in help as well, and people we didn't even know popped out of the woodwork to become huge blessings. One of my favorite cards from those first few days was from a fireman who had helped to put out our fire. He had seen the letters posted on our wall that said "We thank you God"(still hanging up from Thanksgiving- some of you may remember this post from earlier) and felt touched to help his fellow brother and sister in the Lord. He had noticed that we had a little girl and so bought us a carton of diapers, some baby toys, clothes and even some new computer speakers! He included a very nice encouraging card, but gave the gifts anonymously. A letter from the students at the school where my husband teaches also helped to clearly emphasize the idea that the Lord's hand in this whole situation. A few of the students did a study on the theme of fire in Scripture and encouraged us with the reminder that in the Bible, fire is often a symbol of God's presence and that fire is also a metaphor for God's refining work on our characters. It's been neat to see how those two things really have been true for us. We have felt the Lord refining us through some of the stressful and tiring moments, but overwhelmingly we have felt the Lord's love and care through his people. The fire department believes that the fire in our apartment started in the dryer somehow. It certainly was a mess!